is the only government-authorized foreclosure prevention program in Philadelphia. It is staffed by trained lawyers and paralegals who can assist you with your case, connect you with a housing counselor or, in certain instances, refer you to legal services available to eligible low-income homeowners. The City of Philadelphia is committed to helping families facing foreclosure stay in their homes. Philadelphia’s Residential Mortgage Foreclosure Prevention Program gives homeowners a way to negotiate with their mortgage lenders, with the support of housing counselors, volunteer attorneys, and the oversight of the court system. It’s an innovative approach to foreclosure prevention that is making a real difference for the homeowners of this city. Be very wary of people who offer to arrange loan modifications for you for a fee. Many of them are not legitimate. 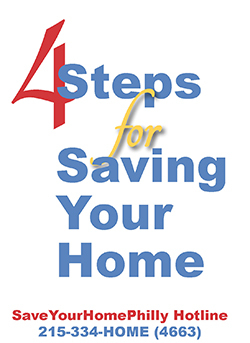 Please contact the SaveYourHomePhilly Hotline at 215-334-HOME (4663) if you have received any offer to arrange a loan modification for a fee, or if you have any questions about mail that you have gotten regarding your mortgage. Is this some kind of scam? How do I know this is a legitimate program? The City’s effort is not a scam. The Program is a joint effort of the Philadelphia Court of Common Pleas and the City of Philadelphia’s Division of Housing and Community Development, which funds the SaveYourHomePhilly Hotline and the Housing Counseling program. The service is provided free to Philadelphia homeowners. Since it began in 2008, the Program has saved nearly 13,000 homes from foreclosure.